Morocco’s Souss Valley is bounded by mountains, desert, and sea. In a matter of kilometers, harsh and barren plains dotted with hardy argan and olive trees give way to rolling hills whose forested shade shelters fruit and almond trees. Crisp and toasted almonds are the perfect flourish atop many classic dishes from Morocco (particularly tagines made with dried fruit) and elsewhere across the Middle East and North Africa. Blanching and toasting them lends them an extra crisp and bring out the best of their flavors, making for a perfect textural contrast. It’s worth blanching and toasting almonds in large batches ahead of time, so that you have them on hand for sprinkling atop dishes whenever inspiration strikes. In a pinch they’re a great substitute for pine nuts as well. Rinse off as many whole almonds as you wish to blanch. Fill a large bowl with cold water and set aside. Bring a pot of water to boil and pre-heat your oven to 325 degrees F.
Once it reaches a rolling boil, drop the almonds in all at once. Let them boil for a minute to 90 seconds, then remove with a slotted spoon and drop them in the cold water. Once they’ve cooled off, squeeze them out of their skins. This will take a few tries to get the hang of it, but once you do it’s actually oddly satisfying. I like to use a two-hand method: squeeze the almond between your thumb and forefinger with your dominant hand and position your other hand so that the almond pops out into it. 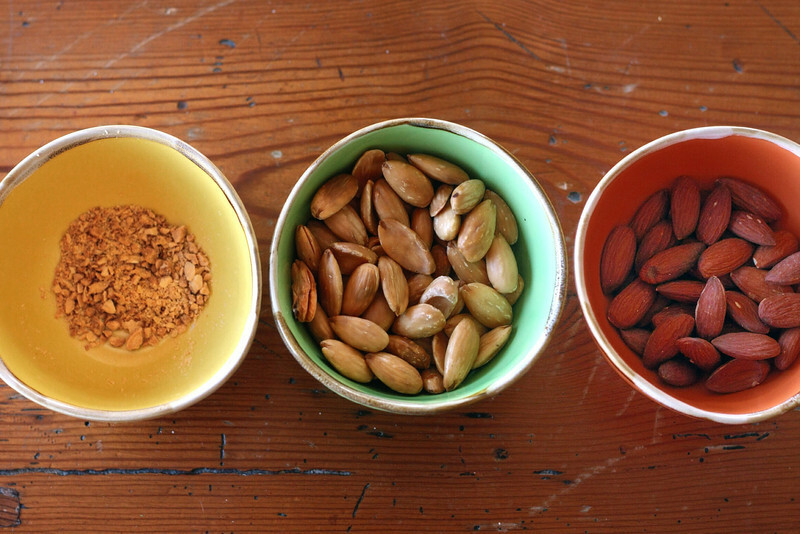 Arrange your skinless almonds on a baking sheet and place in the preheated oven. Toast for 8-10 minutes, turning them once or twice. Keep an eye on them to ensure they don’t burn. You can store the blanched and almonds as they are; if your recipe calls for chopping, I find it’s best to chop them (by hand, with a decent chef’s knife that will give you good leverage, or with a food processor) just before you’re ready to serve.